The “Here, We Go” Roadshow events are a great way for UH alumni and friends to connect with their Cougar family across the country. 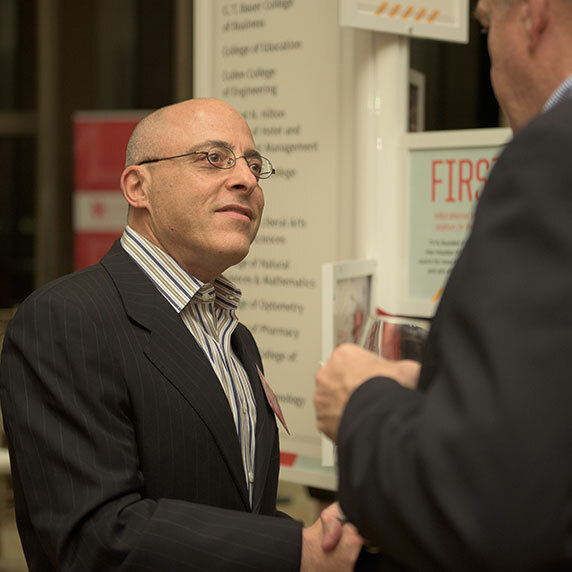 But when Lanny Sachnowitz (M.B.A. ’91) arrived at the Los Angeles event on March 30, 2017, he didn’t just reconnect with his Cougar family: he actually met a distant cousin. “We obviously had no idea that we were both connected to UH and were both on the west coast. It was quite a funny coincidence,” Sachnowitz says. Sachnowitz, who is managing director at Stanley Capital Management, has more than one family connection to the University: his father, Larry J. Sachnowitz, owned a marketing and advertising agency that created the “Changing Minds” campaign in the 1980’s, and was also an adjunct professor at the business and entrepreneurship program. When his father passed away in 2001, Sachnowitz and his family created an endowed professorship in his father’s name to memorialize his legacy. Professor Betsy Gelb (Ph.D. ’73) was named the inaugural Larry J. Sachnowitz Professor of Marketing & Entrepreneurship at Bauer College of Business, and remains in that role today. Ted Bauer — who made the transformative gift that gave the C.T. Bauer College of Business its name in 2000 — was another influential figure in Sachnowitz’s life. “Ted Bauer was not just a great boss and mentor to me and so many of my colleagues at AIM Investments, he was a remarkable role model and someone I still today consider to be a true hero.” A number of AIM employees, including Sachnowitz, contributed to the campaign to build the AIM Center for Investment Management in Melcher Hall, where students can gain real world experience in a state-of-the-art learning laboratory. Working with UH students, though, is one of Sachnowitz’s favorite UH memories. “After Mr. Bauer made the gift, I served as an advisor to the student portfolio managers of the Cougar Fund, and would meet with them periodically to review their investment picks,” he recalls. “That was very meaningful to know I was contributing to their education and experience in a small way. I also was a guest lecturer on a few occasions. Coming full circle, from being a graduate student to a guest lecturer, was actually fun and rewarding.” He recalls meeting an M.B.A. student at a Bauer event and being so impressed that he invited her to interview, and she ultimately joined his team at AIM. He hopes that other alumni and UH supporters will re-engage with the University, especially now, during the “Here, We Go” Campaign. “At a minimum, you should familiarize yourself with what’s happening at UH because it is an amazing and transformative undertaking,” he says. As UH moves forward, further, faster toward our “Here, We Go” Campaign goal of $1 billion, it’s good to know that Coogs can always find their way home, whether it’s on campus or at a national event. Visit our events page to find out when the “Here, We Go” Roadshow will be in a city near you!